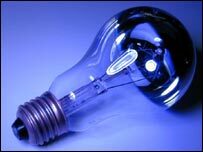 A Californian politician is aiming to bring in a law banning the sale of traditional light bulbs in the state. California Assemblyman Lloyd Levine wants incandescent light bulbs banned by 2012, in favour of energy-saving fluorescent lights. The planned legislation would be known as the How Many Legislators Does It Take To Change A Light Bulb Act. The Democrat intends to introduce his bill this week. He has already forced retailers to recycle more plastic. "Incandescent light bulbs were first developed almost 125 years ago, and since that time they have undergone no major modifications," he said. "Meanwhile, they remain incredibly inefficient, converting only about 5% of the energy they receive into light." Lighting currently accounts for about a fifth of the average US home's electricity costs. California is leading the way in the US on environmental good practice. It was the first US state to target cuts in greenhouse gas emissions, aiming for a 25% reduction by 2020.